(BROOKLYN, N.Y.) -- NEWS: Thousands of athletes from all over the East Coast, from first-grade through college and beyond, competed this weekend at the third preliminary of the nation's largest women's amateur track and field series, the Colgate Women's Games (Dec. 28-30, 2018). 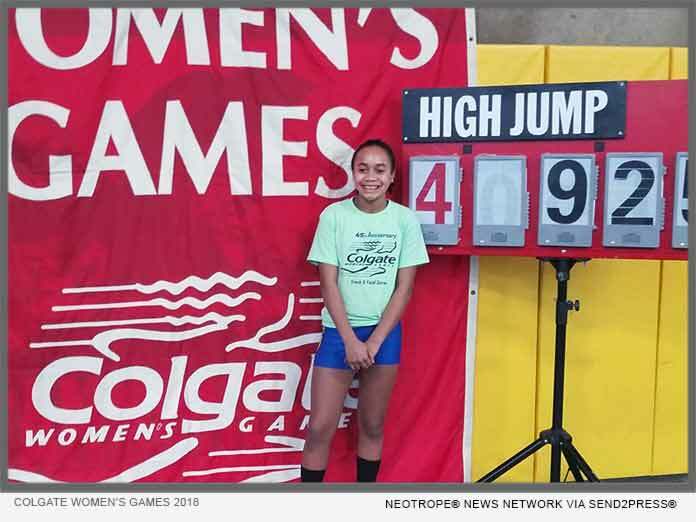 Local contenders and nationally ranked talent in every division continued to excel, and in the last event of the holiday weekend on Sunday, Kiara Davis of Wilbur Elementary School in Bear, DE broke the Elementary B High Jump record clearing the bar at 4-feet 9.25-inches. Davis had been tying My'khiyah Williams' record 4-feet 9-inches in both earlier preliminaries, and ended an exciting weekend of competition with the record breaking performance. Williams, now a senior at Benjamin Banneker Academy Brooklyn, NY still holds the Mid School record at 5-feet 6 inches, and is presently in first place in the High School division. Davis also won her division's 55 meter-hurdles in 10.24. In the High School division on Friday, two-time Junior Olympic champion and last year's Mid school champion, Peyton Rollins of Buckingham Brown & Nichols School in Cambridge, MA, won the 55-meter hurdles in 8.53; Rollins who travels more than 210 miles from the Boston area to Brooklyn each meet is a freshman competing against some of the nation's best High School talent, including Anjoli Mathew another Junior Olympic champion from Brookline High School also in Massachusetts, who placed second in 8.61. Michel Parker of Promise Academy in Manhattan improved from a fifth place finish last week surprising a fiercely competitive field with a 55 meters win in 7.39. Brianna White of Bishop Loughlin High School in Brooklyn won the 200 meters in 25.63; Kaitlyn Cepeda from Park East High School in Manhattan, remains undefeated in the 400 meters after her win in 59.29; Adia Palmer of Bishop Loughlin also remains undefeated after winning the 800 meters in 2:20.67; Isabel Stronski of Rye Country Day School in Rye, NY, won the 1500 in 5:00.09. Two-time Colgate Games' High Jump record holder My'khiyah Williams cleared 5-feet 4-inches for the win; and Mariam Chase also of Promise Academy retook the lead in the shot put with a new personal best toss of 11.49. Meet Director Cheryl Toussaint said "We're again so pleased at the number of families who chose to spend New Year's weekend with us cheering on their girls. With so many returning stars and newly crowned AAU Junior Olympians competing, this season's competition is turning out to be as fun, fierce and better than ever." Saturday in the Mid School division, national sprint sensation and four-time Colgate Women's Games' record holder Avery Lewis of Westtown School, West Chester, PA scored her third consecutive double win. Lewis won the 55 meters in 7.32, and the 200M in 25.8. Tai Sheppard of Community Partnership Charter School in Brooklyn, retook first place in the 55- meter hurdles with a win in 8.48; Sheppard has been trading wins with Taleea Buxton of Philadelphia as the pair continue to set new personal records. Junior Olympic champion Tori Daniels of Valley Stream North in Long Island, NY won the 400 meters in her personal best 59.86. Daniels won four USATF Junior Olympic Championship events in 2018. Alissa Graham of Park Slope Middle School, Brooklyn scored a double win in the distance races, placing first in the 800 meters in 2:22.77, and the 1500 meters in 4:58.08. Rowan Houston of Rye Country Day School won the high jump at 5-feet 4-inches, a personal best; and Jessica Manzueta of Sacred Heart Grade School in Yonkers, NY won the shot put, tossing 8.78 meters. Brooklyn 70 Year-Old Competes in her 42nd Colgate Women's Games! Also on Saturday, in the 30'w plus division, Jennifer Pinto, 70 of Brooklyn, NY appeared in her 42nd Colgate Women's Games Series. Pinto, who was ranked second in the world in the Women's Masters in her 40's, wore a Colgate Women's Games 15th Anniversary shirt to Pratt to compete in the 200 meters. USATF Masters Champion Lisa Edwards of the Bronx, who has competed in the Colgate Women's Games for 34 years, won that race in 27.52, her fastest this series. Sunday in the Elementary B division, last year's 55 meters champion Amirah Nesmith of St. Helena Incarnation School in Philadelphia, won the 55 meters in 8:07 and the 200 meters in 28.45; Additional outstanding performances and results for all divisions are available at colgategames.com/results. Four preliminary meets and a semi-finals at Pratt Institute determine who will compete at the finals at the New Balance Track and Field Center at The Armory, New York Saturday, February 2, 2019, where trophies and educational grants-in-aid from Colgate-Palmolive Company (NYSE: CL) are awarded to top place finishers in each grade division.